Extra basil? Make pesto! I just pulled up the last 10 of my basil plants, and had more basil than I have ever seen before in one place. While I can think of many dishes to make with basil, the best way I know to store that much basil long-term is to make pesto and freeze it in single serving batches (in plastic bags), thereby having fresh pesto at my disposal all winter. There are many forms of pesto, but I tend to make a simple pesto that focuses on the clean flavor of the basil as opposed to the mad mix of ingredients that creates a more aggressive sauce. According to ancient legend (cue the smoke machines), pesto originated in Genoa, in the Liguria region of northern Italy. 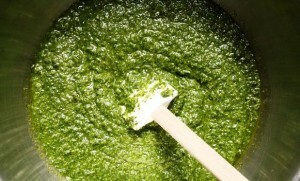 They consider themselves the “true pesto aficionados” and make their pesto a very simple sauce, without many additives. For some reason I have latched onto this, and make my pesto in their classic way, using nothing but basil, garlic, salt, and olive oil. While pesto still tastes great with Parmesan cheese and pignoli (pine nuts), my personal preference is for the robust basil flavor without anything else getting in my tongue’s way. Folks who come to my house are almost always served the following pesto. I have omitted measurements for a reason. 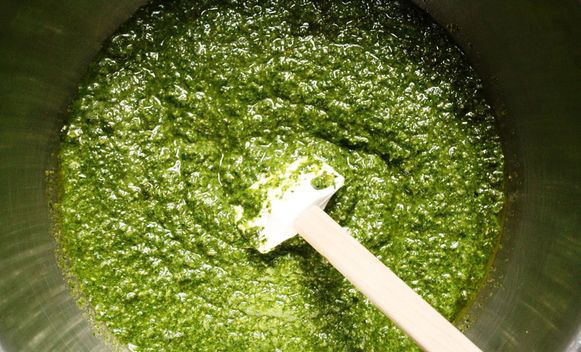 The best results don’t come from careful measurements, but from making a pesto that you like. Some prefer more oil, some less (you still need enough to keep oxygen from turning the basil brown, so be sure to use the olive oil liberally). For this recipe you can probably get away with 1/4 cup of oil for each 2 cups of basil, but you are better off using more than less to prevent oxidation of the leaves. 1. Put all dry ingredients in a food processor, pulse gently, then slowly add the oil until all ingredients are blended. yes, it’s that simple. Traditional pesto is made in a mortar and pestle, but these days, it is far easier to just use the food processor. N.B. if you want a more robust pesto with pignoli and cheese, you can use the following recipe. 1. Combine basil and pine nuts in a food processor and blend gently. Add garlic, pulse, and then pour in the olive oil slowly while blending. Add cheese and salt and pepper, blend momentarily and you are done.